Cam-Bar features: Integrated sound bar with camera, a pair of 2-way pro audio acoustically tuned loudspeakers, professional integrated ZoomSHOT camera with 19x motorized zoom lens and auto-focus and Vaddio's quick-set manual pan-tilt camera adjustment system. Easily connect laptops or tablets for local presentations PowerPoint, Keynote, etc. High definition videoconferencing using Skype, Microsoft Lync, WebEx, etc. SIP-based Voice over IP (VoIP) for multi-person audio conferencing. High definition videoconferencing using Skype, Microsoft Lync, WebEx, etc. SIP-based Voice over IP (VoIP) for multi-person audio conferencing. 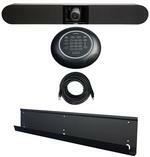 System Includes: Mic-Dock, Cam-Bar, 25' Shielded Cat-6 cable and Wall Mounting System. Cam-Bar features: Integrated sound bar with camera, a pair of 2-way pro audio acoustically tuned loudspeakers, professional integrated WideSHOT camera and auto-focus and Vaddio's quick-set manual pan-tilt camera adjustment system. System Includes: Mic-Dock, Cam-Bar, 25' Shielded Cat-6 cable, PC-to-Dock Interface Cable. and Wall Mounting System.